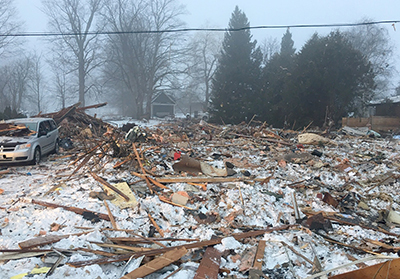 One man has been pronounced dead after a house exploded in Caledon Village on Sunday at about 6:20 a.m.
Caledon OPP identified the victim as Joseph Westcott, 54, of 9 Maple Grove Rd. Officers found debris of the house littered throughout the neighbourhood. Mr. Westcott’s single-storey home was decimated, and a silver van, in what appears to be a driveway, had wood chips around it. A Facebook page and LinkedIn profile, believed to belong to the victim, states he was a journeyman with IBEW Local 353. OPP officers evacuated 30 to 35 people as their homes were severely damaged. Mayor Allan Thompson said the natural gas was shut off in the area, making it safe for emergency personnel. He said there is no gas leak and that nobody else was hurt. Charleston Sideroad was closed off from Highway 10 to Kennedy Road, but re-opened Monday morning. Caledon OPP and OFMEM continue to investigate on scene. Brampton Fire and Emergency Services also helped. Chief Bailey said they have a drone performing low level flyovers trying to ensure that everybody is safe. A total of 22 surrounding homes were damaged, at least seven of them severely, and four have been deemed unsafe to occupy and have been released to the town..
Ms. Gaynor said some of the homes have structural damage, step fractures in the bricks and some roofs became misaligned, having been raised in the air by the blast. Ms. Gaynor said some of the homes don’t have gas or hydro and need structural engineers to look over their properties. Technical Standards and Safety Authority officials and OFMEM engineers were examining all fuel systems in the house. An excavator was seen shifting through debris at the property where the explosion occurred. Components of debris have been taken to the OFMEM’s laboratory in Midhurst, where an expert will examine pieces to try to determine how the explosion happened. Crews will also look at all appliances such as the furnace and hot water tank to pinpoint the exact cause. “We will be de-layering that scene and we will be looking for all the fuel delivery system components,” Ms. Gaynor said. They have not been able to identify what caused the explosion. Further, they have not been able to rule any causes out. “We certainly don’t want to be narrow minded and go down one path,” she said. “We want to be open to any possibility and that’s why it’s going to take a significant amount of time to go through all the debris. Peel paramedics have been working to provide temporary shelter for displaced residents. Caledon OPP Insp. Ryan Carothers urged drivers to avoid the area until it is safe. He said it will be a lengthily investigation lasting about a few days. Caterina Camilleri, who lives nearby, said she was shaken up, in disbelief and is staying at a friend’s house on Kennedy Road. She said it felt like an earthquake was occurring inside her house. Everything was shaking when she jumped out of bed. Her husband went outside gathering with neighbours witnessing the destroyed house. Melanie Thompson-Singer, a registered nurse who lives two streets away from the explosion, said she moved to the village 11 years ago. She said she never experienced anything like this before. She initially thought a meteor hit the ground or a plane crashed with debris hitting her house. Those evacuated were taken to Knox United Church where they stayed and were provided with coffee, tea and food. A meeting was held Monday night where impacted homeowners were provided with an update on the status of their homes. Of the homes, seven were released back to homeowners. As for the four properties released to the town, inspections by town building inspectors resulted in orders that they were currently unsafe to occupy. “Beginning today, these homeowners, along with their insurance agencies, will be granted access so that adjusters, engineers and/or other experts can assess any damage,” said David Arbuckle, general manager of strategic initiatives for the Town of Caledon. “Once the homeowner is able to present the Town with an assessment of the property and a remediation plan (if necessary) the unsafe order will be lifted, and the owner will have full access to their home. Sarah Shaw, who lives at 3 Maple Grove Rd., posted on Facebook in the Caledon Village Community Group that she was home with her dog, Finn. Officers remain on site to provide security in the area. Drone operators are advised that they are not permitted within 2500 feet of an active investigation. Displaced residents looking to connect with family can contact and find support can contact the Canadian Red Cross at 416-676-8559, the Town of Caledon at 905-584-2272 and the Region of Peel at 905-791-7800. Inquiries about residential gas utilities and re-energizing hydro services if residents have not been provided with another contact can call Enbridge Gas at 1-866-763-5427 and Hydro One at 1-800-434-1235. Those in need of trauma counselling and other pyscho-social supports can call the Caledon and Dufferin Victim Services at 905-951-3838.